Converts into a Stamina ability and deals Disease Damage. Also heals you if the target dies within two seconds of use. Allows you to use the ability at range. Assassin's Blade: Thrust a magic blade with lethal precision to stab an enemy, dealing [3074 / 3106 / 3140 / 3175] Magic Damage. Deals 300% more damage to enemies below 25% Health. Killer's Blade: Cost: 2066 Stamina. Impale: Range: [25 / 26 / 27 / 28] meters. Assassin's Blade deals Magic Damage, with increased damage to targets with low health. 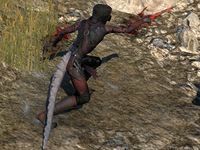 The Killer's Blade morph changes it to have a Stamina cost and deal Disease Damage, also healing you if the target dies shortly after use. Or you can use the Impale morph, which allows it to be used at a distance. Impale is a recommended morph for the Nightblade Initiate and Deathweaver builds, while Killer's Blade is recommended for Umbral Assassin. This ability's visual effects are now easier to see. Killer's Blade: This morph now deals Disease Damage instead of Magic Damage. Impale: Increased the range of this morph to 28 meters at Rank IV from 18 meters. The bonus damage dealt by execute abilities, such as Assassin's Blade or Reverse Slash, now works more intuitively with global damage done bonuses, such as Mighty or Minor/Major Berserk. Execute bonus damage is now multiplicative with global damage bonuses instead of additive. The damage from this ability and its morphs can now be blocked and dodged. This ability and its morphs now deal their bonus execute damage when the target is below 25% Health, down from 26% Health.